Do you want to change the look of your forms? 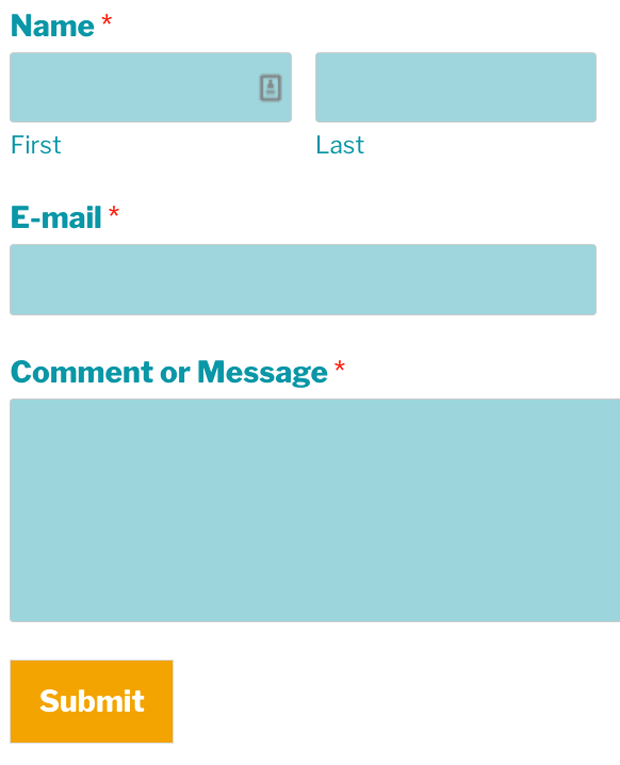 Out of the box, your forms may look rather plain on your site. 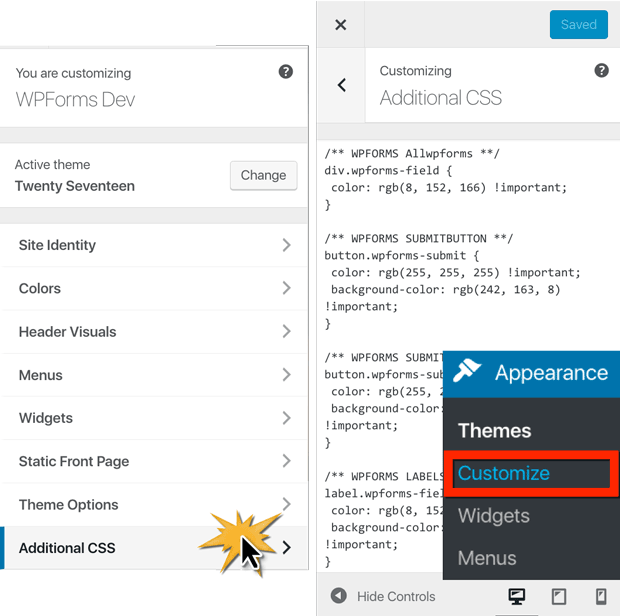 Thankfully, WPForms can be easily customized using CSS in your WordPress theme. In this article, we’ll show you how to style contact forms in WordPress. If you don’t know how to write CSS code, don’t worry. We can still walk you through customizing your form styles. Just follow our tutorial on how to style WPForms without knowing any code. Your form may look slightly different, since it will inherit some of its styling from your WordPress theme. Other than that, it’s very basic. WPForms generates code for each form to give it its basic styling. For many users, this will be enough since the default styling will be unobtrusive and not distract from their site’s design. However, if you want to create a unique look for your forms, you will need to add your own CSS code to customize the style. We’ll show you how to do both, and then share some examples for your inspiration. 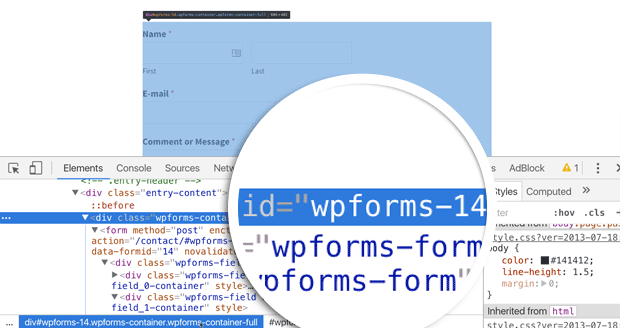 Every form made with WPForms uses the CSS class .wpforms-form in the form HTML tag. You can use that class to style WPForms without affecting other forms on your site, such as your comment submission form under each post. Every individual element in the form (fields, buttons, etc.) also has a proper ID and CSS class associated with it, which you can use for more precise targeting. You have several options for how to include the CSS code mentioned above. First, you can add it to WordPress by going to Appearance » Customize » Additional CSS. Add your CSS code to this location and save your changes. If you prefer, you can place this code into your child theme‘s stylesheet. You can also add this code to your site with a plugin like Simple CSS. One thing to keep in mind with CSS we used above is that it will be applied to all forms made with WPForms on your website. If you are using multiple contact forms and want to style each of them differently, then you will need to use the unique ID generated by WPForms for each form. Simply open a page containing the form you want to modify. 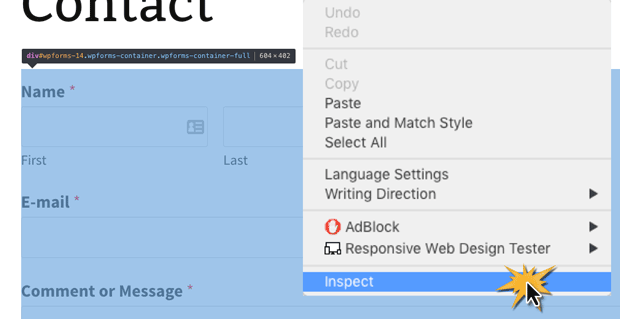 Take your mouse to the first field in the form, right click » Inspect Element. The browser screen will split, and you will see the source code of the page. In the source code, you need to locate the starting line of the form code. The id attribute is a unique identifier generated by WPForms for this particular form. We will use this ID in our CSS to style our contact form. We will replace .wpforms in our first CSS snippet with #wpforms-14. 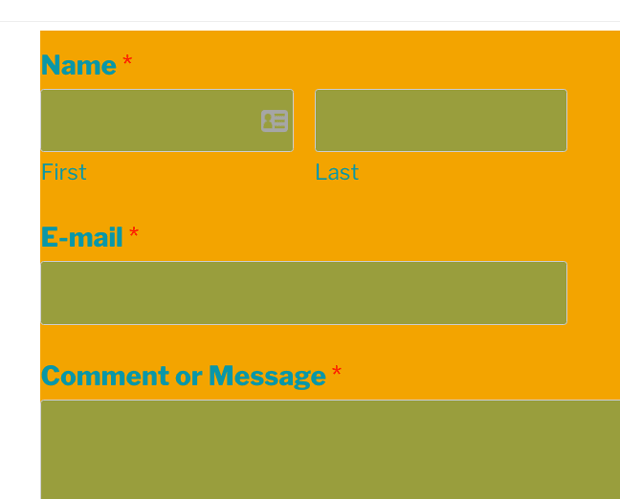 The resulting form would show an orange background on just this form, but no other forms on the rest of your site. You’re on your way to having a customized contact form. 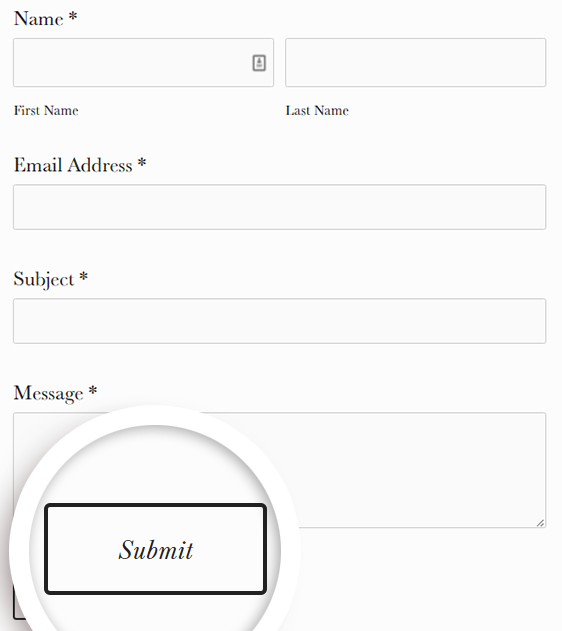 You can encourage your visitors to complete your contact form by giving it an attractive and eye-catching style. 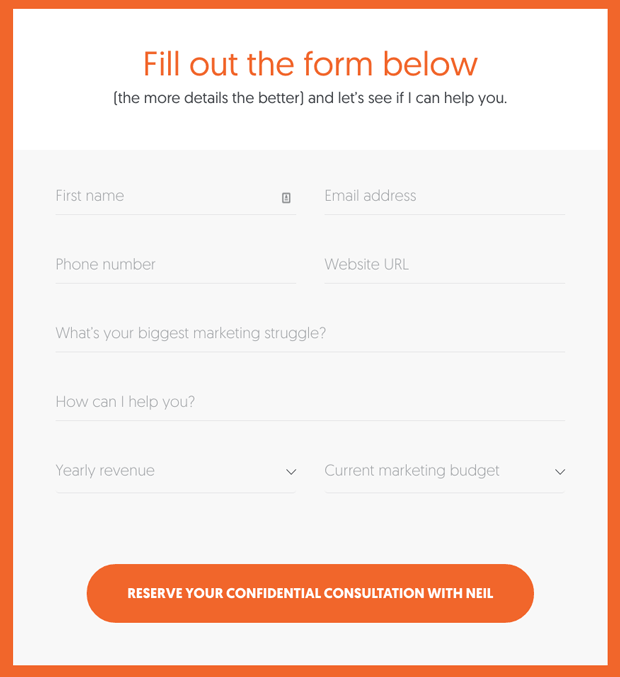 Neil Patel’s form is clean and incorporates a button color that matches the website colors. Each field has removed any borders around the entry box as well. A 2-column layout has been implemented throughout most of the form questions as well. 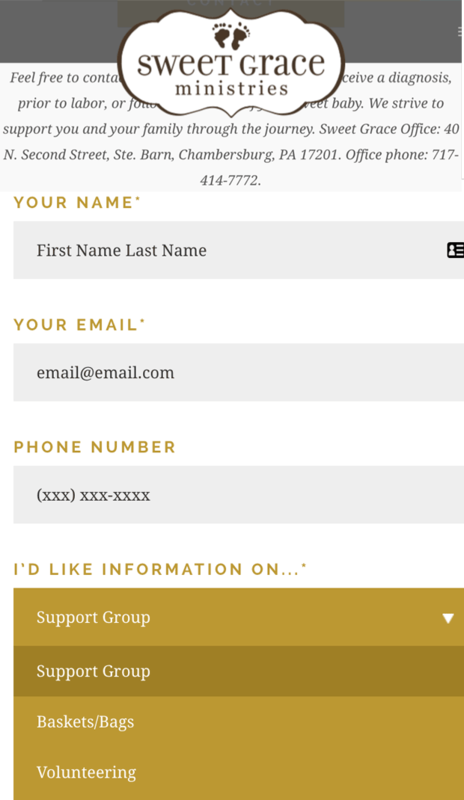 Sweet Grace Ministries as styled their contact form to include the accent color in the form field titles, as well as within the drop-down menu. GirlBoss tweaked the font style on their submit button. UnMarketing has included some eye catching symbols as form labels. Now you’re all set! 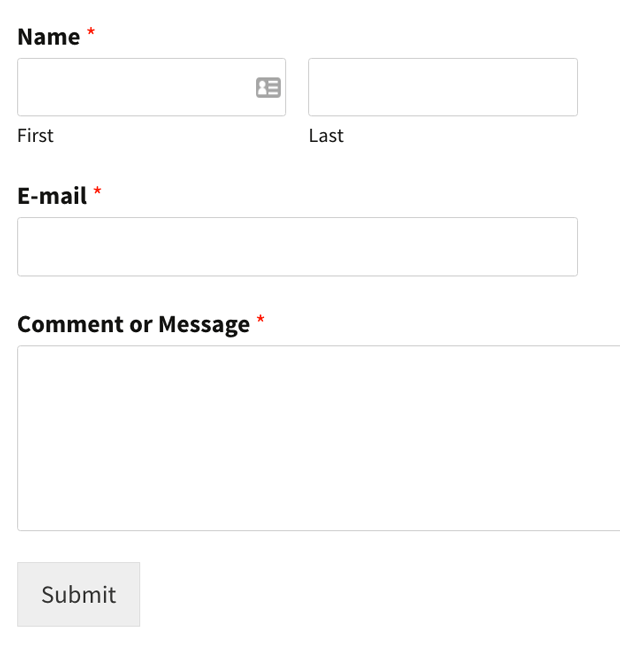 We hope this article helped you learn how to style contact forms in WordPress. Want another way to encourage your visitors to complete your contact form? Check out our guide on how to create popup forms in WordPress. 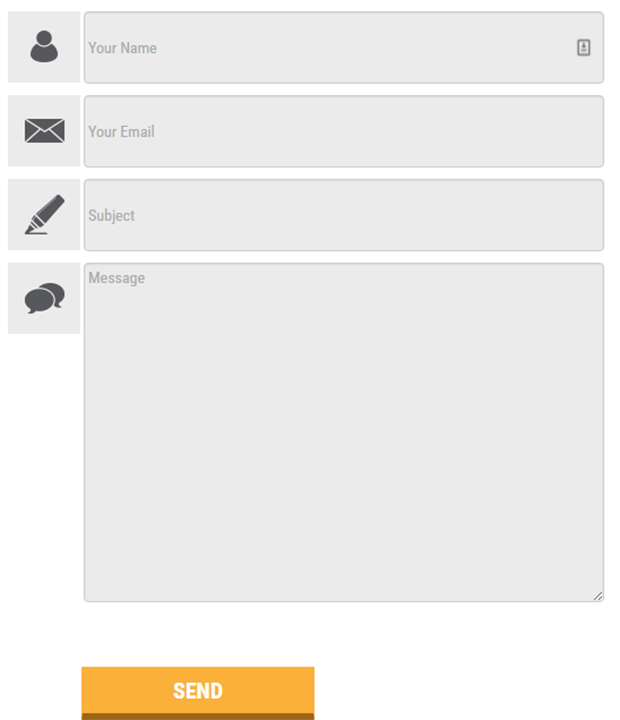 Have a great contact form example? Share a link to it in the comments below. None of the information provided about how to alter the default buttons appearance for the customers theme is helpful. It’s a waste of time sifting through all this. Sorry you didn’t find this post useful. We tried to make it as comprehensive and helpful as possible. Which buttons exactly are you trying to style, and how are you trying to style them? With more information, we can help you get the style you want. Feel free to reply here, or contact support for specific help. You might also consider trying out CSS Hero. It lets you just point & click to style your forms, without having to mess with code. I love some of these modifications. How do I change the submit button? I’m trying to change the color of the button and make the radius more round. You’ll actually want to add that bit of code in the Appearance » Customize » Additional CSS menu in the WordPress dashboard (you can see a screenshot above). If you need any assistance, feel free to get in touch with support! Is there a possibility to only change the style of the “label-text” above a checkbox? How do I add a border? Feel free to modify that CSS to fit your needs. Currently the border is set to a thickness of 1 pixel (1px) and has a light grey color (#eeeeee).If you’re not sure what color hex code you’d like to use, you can create one with this color picker. In case you’re interested, there are a ton more details about all of the CSS options available for borders here. You’ll notice, too, that the CSS I shared also includes padding: 15px 20px;. This pushes the border away from the form text (without it, the border would appear to touch the text). This will add 15 pixels of padding to the top and bottom of the form and 20 pixels of padding to the right and left sides. Wasn’t the goal of WPForms to be “the most user-friendly WordPress form builder” in the market? For changing something simple like the look of a button to match the design of your site, you need to start digging into CSS??? Currently we don’t have any plans to release a full blown form style editor. The primary reason is because it’s not a feature that the majority of our users would use but would take a lot of time to support properly. However, we do realize that having the ability to style items in this manner is preferred by some users, so we partnered with CSS Hero and now have full support. You can learn more about CSS Hero here https://wpforms.com/wpforms-css-hero-customization-made-easy/. Of course, CSS Hero can be used site wide, not just for your contact forms. It’s a super handy plugin and lets users avoid touching any code. We also have a coupon code you can use at checkout WPFORMSVIP. I started working with the CSS samples and it is actually simpler than I thought. But I cannot figure out how to center or right align the Submit button. Any CSS sample code for that? I am also looking for some CSS to change the background and text color of the confirmation after submitting the form. The background is always light green currently and I would like to change it to match the color scheme of my web site. No problem! We have a tutorial over in our developer docs that should help you out: Remove confirmation message box styling. You can replace those hex codes (#ffffff, which is white and #000000, which is black) with any values you like. The background hex code can also be replaced with ‘none’ (no quotes) to just remove the background color altogether. If you’re not sure what hex code to use, I like this tool. I was able to change the confirmation box with below code. But whatever I do, the text always stays black. Have a look at below CSS. I assume the color entry is to set the color of the text. Am I correct? Ignore last question please. It works now. I’d also like to change the fonts on the form but I can’t seem to do this either. Any advice on these two points? I would suggesting giving that a shot, and if it’s not quite right let us know (we’ll probably need to see your embedded form, so you could share those details in a ticket). Just swap arial out for whichever font you like! If you’d like to bring in additional fonts beyond what your theme offers, here’s a tutorial on how to do that. If you run into any issues with either of these, could you please contact us in support? Neither of these seem to work. I’ll have to contact via support. I think the reason that the bullet points can’t be edited is because ::before is a pseudo-class rather than a regular class. I’m puzzled about the fonts. Omg, your post really saved my life. Thank you very much! Do you have a full list of all the WPForms CSS classes? I’d love to style more than just the text fields and submit button. Yes, we do! We have a breakdown of all styles applied to various form components in this tutorial. I apologize for the trouble! If you check out this tutorial, it will show you how to get all of your form fields on a single line. Making these boxes different widths along that line is a bit more custom, but if you’d like to reach out to us in support we’d be happy to help you with this. Hi there, thanks for a wonderful form and page. I am new to CSS but I have successfully managed to customize my form in the “extra CSS field” in word press: with this code. The problems has occured when I individually try to customize the button of a second form. I identified the id number of the form and when I use your example above with the background color, it works. But I can not figure out how to cuastomize the button color and hover color. I could enormously appreciate your help. where would I put in the ID number for the second form on the site that Iw ould like to personalize individually? In that example, my form’s ID is 48. In case it helps, you can find the form ID in the shortcode where your form is embedded or right on WPForms > All Forms (here’s a screenshot). Hi I was wondering how to adjust the vertical space between each field in a form. Right now, there are 10 pixels of padding at the top and bottom of each field, but if you include this CSS with a changed value it will apply to all fields. Just note that you’ll only want to change the first number (10px), as the zero applies to the left-right padding. How do you change the font of the text that is being typed into a form? In other words, if I have a contact form on a site that is styled using the Google Muli font, what CSS do I need to have Muli be the font that appears in every box as the visitor types their responses? Thanks! The only thing to note is that any Google Font will only work in your form if the font is already being loaded on your form page (which it sounds like it is). Just in case, though, here’s a tutorial from WPBeginner on how to include Google Fonts on your site. I thought I was done, but the CSS you provided works (great) for single line input fields but not for “message” or paragraph fields. Thanks for this article, it’s been really helpful. The only thing I can’t seem to find is how to change the input font colour! I’ve changed labels, background colour etc, but wondered if I’ve missed the bit about inputting the text. My contact form is on a dark background and I’d like the user’s input text to be white. I’ve gone ahead and set the hex value in this CSS to #fff, which is white. If you add this CSS to your site using the instructions in this article you should be all set! How would I got about appyling a border-radius value to all of the text-area and input fields in the form? I’ve currently tried multiple values with no success. In case it helps, you can find all default CSS for input areas in this tutorial (if you follow that link it should take you to the Global Form Field Selectors section, then you’ll want to look under Boxes Around All Input Fields. If you’d like to customize more aspects of your forms, that tutorial is a great reference for finding what CSS to use to target the right part(s) of your forms. I am using WP Forms and would like to have my field and submit button in one row. Is it possible to do that with custom CSS? Yes, we actually have an easy setup for that 🙂 You’ll just need to add the CSS class inline-fields to your form. Here’s our tutorial with full details. I’ve pretty much got it formatted the way I want with a header image, and various changes to the text using simple and commands. What I’d like to do is have the logo that is on top of the notification email centered. Can you let me know what CSS I would use for that? Thanks a lot. I’m liking and appreciating WPForms the more I use it and tweak it. I’m glad our forms are working well for you! For the email header, it’s odd that this image isn’t centered for you as we have styles in place to do that when the method from our tutorial is used. Hi I have read through all these comments and made some changes with reasonable success, however I cannot find anything that would help me to change the font-family, fon- size and font colour of the placeholder text. Can you advise please? I created the values for the text color (which uses a color hex code, like #aaaaaa above), font size, and font family above, but you can replace these to best fit your site design. First of all, I love wpforms! Is it possible to change only in the submit button the colour of the letters? Now it is black and I would like to change is white. The hex value #fff, represents the color white. In case it helps, the easiest way to add this CSS is in the WordPress CSS editor under Appearance » Customize » Additional CSS. Yes, thank you very much! It works!!! There are a few common issues we see that prevent CSS from working — I’d recommend checking our our troubleshooting tutorial, which covers each in detail. If you give that a shot and would like some extra help, could you please let us know? We provide support for our Lite users here and our paid license holders here. I need to place a paragraph of text before a response box. The only way I could do this is to use a Single Line Text or Paragraph Text box and pre-filling in the “Placeholder” field. I realize that there is no way to “lock” this field. I would like to change the font on this pre-filled text to black font (instead of the default gray). I can’t seem to get the CSS to do this. If you’re using any of our paid licenses, the best approach for this is to use an HTML field. Or if you’re using Lite, you might consider using the description area of a field – or the description area of the form (in the form builder under Settings > General). Whichever approach you choose, we have a tutorial to help you apply custom styles. Here’s our tutorial on styling placeholder text, and here’s our tutorial on styling most other aspects of your form. I hope that helps! If you have additional questions, please let us know! We provide support for our paid license holder here and for our Lite users here. Hi, I’m trying to add a background image to the form fields ¿is there any simple way to do that? Thanks in advance! This may take some effort to style exactly how you’d like, but hopefully that helps you to get started! I’d also recommend checking out our beginner’s guide to CSS for details like targeting a specific form. I am trying to change the background color of the input box when the user clicks on it to type. Right now it is bright blue and I’d like it to be white. It sounds like your theme is applying that bright blue style. By default, our forms apply only a very subtle style change when the user clicks inside an input box (here’s a short screencast video to demo this, and you’ll see that the outline of the active box gets just slightly darker). There may be a setting to change this in your theme’s settings, otherwise you could contact your theme’s author to ask them for help removing this styling. And if you currently have/decide to purchase a paid license for WPForms, our support can certainly assist further. I would simply like to add padding or center my form on my site and it’s like pulling teeth to find out how. Learning CSS was not something I bargained for when I paid for this service and I’m quite disappointed. I am doing my part in learning what I can now that I’m invested, but I can’t help but feel like I’ve been suckered out of my money. How would I go about adding padding around my form so it’s not shoved all the way to the right side of the website? I apologize for the frustration, and from your description it sounds like your theme is adding styles that are pushing the form like this. But please know we’d be happy to help you get this sorted! When you get a chance, please get in touch with our support team. Just let us know the URL where your form is displayed, along with any issues you see, and we can assist from there. Hey, I love WP-forms and actually wp-forms made me learn some css, which is great. The best way to change the size of field input boxes is to use our built in option. If you’d like to give this a try, you’ll need to open the form builder and click the field in the preview area. This will open the Field Options, and from here open Advanced Options. Within this section, you should see a dropdown named Field Size (shown in this screenshot). If you’d prefer to create more custom widths, you can find the CSS for each field size in our doc on styling fields (this link will take you to the section named “Global Form Field Selectors”, and if you scroll within that you’ll find CSS for each field size). Just copy this CSS into your stylesheet and change as needed. Would you please tell me if it is possible to use custom CSS to do the following with your forms? 2) To replace UI elements like input boxes and drop-down list outline and arrow? What I am looking to do is create a either a hand-drawn or a vintage typed look to the entire form. Sure, it’s possible to use custom CSS to do most of the things you mentioned. For the font, we don’t actually apply any font within our forms — this is pulled entirely from the theme. So you can add a font in the same way you would for other parts of your WordPress site (in case it helps, here’s a tutorial from WPBeginner on adding custom fonts to your site). You can also custom style input boxes. If you add some custom CSS, the styles you can create are nearly unlimited. However, dropdowns are unfortunately not customizable in this same way. The reason is that, as odd as it may sound, dropdown field styles are determined by the browser. This is why dropdowns (as well as checkboxes and radio buttons) all look different in Chrome, Safari, Firefox, etc. While there are ways to get around this, the code involved tends to be pretty complex. I apologize as we’re not able to provide support for this level of customization. Thank you very much for your answers. Not surprised tat customising the UI elements is much more involved, but it’s great that other things are so accessible. I have already loaded custom fonts and used custom CSS, and I was now looking for a forms plugin. There are lots, some with massive functionality: but this is the best pre-sales support I have seen and this is the plugin for me. Sorry, I forgot to ask: if it is possible to customise the Ui elements like boxes and drop-down lists as per 2) above, are the restyled elements still responsive? The responsiveness of these elements will only be impacted if you set a new width, which I would advise against. Better to keep our built-in widths for fields so that you don’t have to re-configure this part of styles. I have created a form in WPForms and put it’s shortcode into a popup. I set the form up with two fields (name and email) but when it appears in the popup on my site, there is always a third random field there – sometimes it’s a second Name field, sometimes Phone, sometimes Message, sometimes Website. Why, and how do I fix it? Secondly, how do I style my form in a popup? I can’t see anywhere to add custom CSS. We’d be happy to help! When you get a chance, please drop us a line in support so we can assist. How is it possible to change the text color of the email address input field? i.e. the email address that the form user will submit. Here’s a screenshot of how this would look when your form is filled out (you’ll notice only the email input color is changed). However, it’s important to note that this will not alter the color of the email value anywhere else (the CSS above will apply only to the text entered in the embedded form). If this fits what you have in mind, here’s a tutorial from WPBeginner on how to add custom CSS like this to your site. Could you confirm the CSS for this please? The styles you’re seeing are most likely coming from your site’s theme, and would need to be overridden with custom styles. While we’re not able to provide support for this level of customization, here are a couple of popular approaches: writing custom CSS or using CSS Hero so you can avoid touching code. Hopefully those resources give you a better idea of how to get started! How do I change the font color of the asterisk? Hello, I am having issues changing the background color on my “contact” form, In the message area on my form when a user clicks inside the message input area the input area box background turns purple and the text is hard to read. I want to change the input area background to white. did I explain this well enough? In case it helps, here’s a tutorial from WPBeginner on easy ways to add custom CSS like this to your site. it only changes the font of the description of a field. How can I change font of all the text in the form? If you have any type of caching plugin/service on your site (or if your host does any caching) can you clear/flush that out and check the form again? It could be a caching issue, in this case. Hi, I have a question for the CSS of my form. I have a form that has a label description (text underneath the form field) but I need to edit the font, font colour and font size.